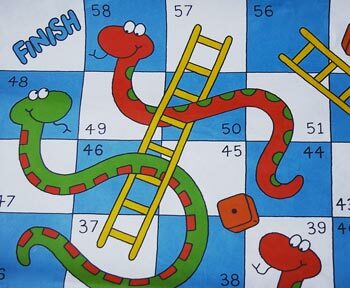 Bernie Kroczek Real Estate | Anyone for Snakes & Ladders? We’ve been off the air for a few weeks meeting the challenges of the day, otherwise know as ‘life stuff’, with Gai in England for two weeks and a new grandson just recently arrived. In the meantime, you would have had to have been on a different planet not to know about the wild gyrations on world share markets over the last few weeks. What has happened in markets over the past three years and in particular the past couple of weeks has convinced me that investing in the sharemarket is not much better than playing the pokies. You speak to ten different economists and get ten different stories as to why sharemarkets are behaving in the way they are. The truth is NO ONE is able to accurately predict which way the market is going to go over the next week, never mind next year, five years or ten years. It’s all become a bit of a game of chance, in which the average ‘Joe Blow’ like you and I are mere pawns. I say pawns because for those of us who have no choice at all as to whether we pay into superannuation, our retirement funds are mere play things of the big players, who get paid zillions of dollars to have fun at someone else’s expense. All through no fault of our own. that economies and sharemarkets are in for a sustained period of low or negative growth, until such time as governments around the world grasp the nettle and show some courage and leadership and do what they should have done years ago. That is stop trying to buy votes through populist policies and instead do what is best for the nation regardless of whether it makes them popular. Can’t see it happening soon, but you never know. I was recently quoted on a similar subject on this blog Messages from the Front Line, if you are interested, by Leith van Onselen, the Unconventional Economist. Macrobusiness.com.au is an excellent site if you like an often contrarian view of the world of economics and politics.